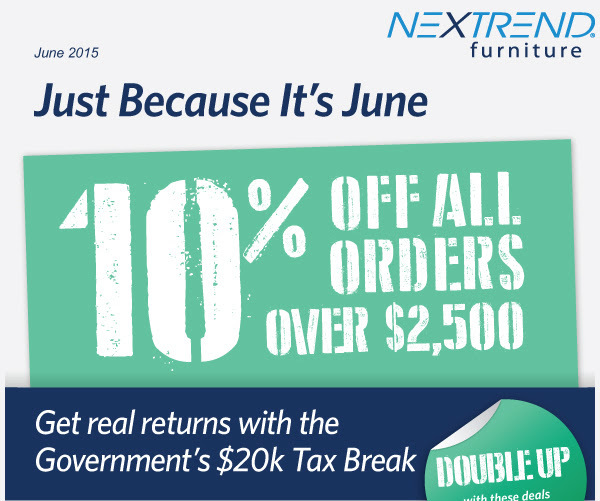 Get more for less with our special offers on selected commercial furniture this June! Save up to 10% off on our Vita Chair in Black. This extremely popular model is versatile and shaped for maximum comfort. Made from UV stable plastic shell and anodised aluminium legs, you can be sure that it will not rust and will withstand even the roughest and toughest Australian weather conditions. We have tried and tested it in the Australian market for over 5 years now and have proven it to have long lasting durability that will look just right in any commercial venue. If you’re looking for comfortable and elegant-looking restaurant chairs that can be used for both indoor and outdoor settings, you’d be glad to do know that we now have huge stocks of the Palm Chair in Chocolate available for immediate dispatch. This classic, durable model has a clean, straight appeal and is made of PE flat rattan that is woven over a heavy duty welded extra thick and strong aluminium tube frame. Get a free cushion for every purchase of our Fiji Sunlounger — Anthracite before end of fiscal year June 30, 2015. Specifically designed for outdoor use, the European-made Fiji Sunlounger is UV stable and weather proof, made of an injection moulded resin lounge with a rattan looking seat, a 5-position reclining back rest, and reinforced with glass fibre to strengthen its legs. It has hidden wheels and non-slip feet too. It is strong and lightweight with a metallic frame that will never unravel or rust, making it perfect for harsh Australian outdoor conditions. The Vita Chair, Palm Chair, and Fiji Sunlounger are all stackable furniture that come with a two-year structural warranty. Looking to upgrade your restaurant tables? Purchase a Duratop 700 sq. Tabletop together with our Astoria Aluminium Table Base and receive a $10.00 discount per top. This base is ergonomically designed and staff friendly as it is one of the lightest ones in the market these days. Made with lightweight commercial grade aluminium, it meets the highest design and durability standards and is so versatile that it can be used with any top up to 80 cm square. Here at Nextrend, we provide a wide range of high quality hospitality furniture for all types of commercial projects all over Australia, such as cafes, restaurants, hotels, clubs, resorts, schools, churches, and government organisations. We feature the latest looks and trends that can suit any style, purpose, scale and budget. Do not miss this chance to upgrade your commercial furniture at less cost by taking advantage of these special offers. Call us at 1300 559 965 now to enquire about our June specials or request for a free quote.